If you love Kale, or have been wanting to try some new kale recipes, this simple recipe for Spicy “Cheesy” Kale Chips from Paulding & Company is a must try! Paulding & Company, a full catering kitchen based in San Francisco boasting vast opportunities for bonding and excitement founded by mother-daughter duo Tracy and Terry Paulding. 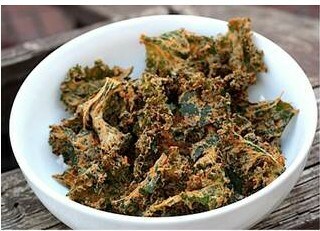 Kale chips are the perfect delicious, yet healthy snack-tons of flavor without gaining the extra weight! Kale chips are all the rage right now! And now you can make your own with this simple recipe! Be sure to purchase ultra-fresh organic vegetables for this. Soak the cashews in water for 3-4 hours. Combine with the stemmed and seeded peppers, lemon, salt and yeast in a blender. Puree. Taste the mixture, and if it needs it, add more salt or lemon. Strip the stems from the kale leaves-you can do this easily by holding the end of the stem in one hand, and firmly running the other hand up the sides of it, dislodging the leaf. The tough part of the stem will come off, leaving the tenderer part intact. In a large bowl, combine the Kale with the blended mixture, using your hands (evenly) as possible distribute the mixture. Lay the leaves onto a dehydrator racks, crowding them but not stacking them. Dehydrate at 105° F for 12-16 hours, until very crisp. Store in sealed zip bags. If you don’t get them dry enough they will soften in the bag. If you don’t have a dehydrator they can be laid out on a rack or over a pan in the oven with the temperature set as low as possible. The time to dehydrate will be greatly reduced, probably to about an hour or even less. For more information on Paulding & Co. recipes, you can check out pauldingandco.com. Your Kale Chips will be amazing! Hope you had a wonderful weekend and thanks so much for sharing your special post with us at Full Plate Thursday! Have a great week and come back soon! Ooo, gonna try this! Pinned! Thanks for sharing at the To Grandma’s House We Go DIY, Crafts, Recipes and More Link Party. Hope to see you again this week! 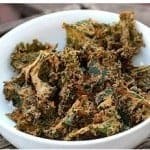 I love kale chips but have never tried making them. Thanks for sharing at the What’s for Dinner party! My husband just asked me to make kale chips the other day. I love this variation, so many great flavors! Guess I am really behind, as I do not recall ever eating kale. I f I did, I did not know it.